The challenge that every girl faces while traveling is striking a good balance between comfort and style especially if you love taking good Instagram pictures as me. Some of you might care about bringing lightweight luggage, but let’s be honest, having plenty of options to wear on a short trip is the first concern we all have. I must say that doing a research for the trip and having in mind what kind of places you want to visit or where you want to take pictures is the first thing. That’s how I do, aesthetics for me are everything. If fashion is your life and it matters most to you, after planing the top places you want to visit, here are some tips to create your perfect packaging routine for every trip. Pack lightly and choose pieces in three matching colors so you can mix and match each piece to create multiple outfits for different days or even different occasions. Pick colors based on and where you’re going. If you’re going to urban destinations, any combination of black, white, navy or charcoal is a good bet. For a beach vacation or outdoors, khaki, off white or white and bright hues like orange/yellow will always work. White linen in particular – it’s cool in warm weather, can be worn during the day and is also nice for an evening out. If wearing jeans and pants a lot is your preference you should put into the count, the fabric, button fastening, the zipper, but the comfort it gives matter too. Do they dig into your waist when seated? Are they too tight? Will it be safe when bending over or reach up? Another option is your sporty Joggers. They are the best pants for flights and they are comfortable as sweatpants but look more stylish and refined. First choose the outfits you can match, then choose the right shoes you can combine across most of the outfits, I usually pack 1 pair for shoes for every 2 items. Most of the time we think the look is going to work perfectly but as we walk, take pictures, visit places you will get focused on the trip that on the everyday looks, be organized and planned. Wear simple makeup during flights. Consider a tinted moisturizer with SPF for a fresh, healthy look and lip balm for a color pop and moisture. This provides healthy well-protected skin barrier. Skip that concealer, mascara or anything highly pigmented – this can all feel dry and the pressure fo the airplane can cause eye infection or dry eyes. Achieve that fresh looking chic even after a long journey rather than struggling yourself with a smudged and sloppy makeup after hours of your trip. Keep your hair down or consider using some leather cap. It’s easier to brush off when it gets frizzy/fluffy rather than sitting up straight the entire flight worrying about your hair-do. Also, while on travel, you can use a mask -this used to be funny to me when I first started traveling in Asia, most Korean and Chinese do-. The first time I did it I was surprised, my skin was smooth and bright over a 12 flight to Houston and still having to catch another 9 hours flight to reach Panama. I was mesmerized. And I love it now! They are truly amazing, especially for long road trips. They are convenient, cozy, and they’re great for adding that stylish layering. It’s perfect as it has many functions. You can wear it around your neck like a regular scarf, you can bundle it up and use it as a makeshift pillow, then when you get cold, open it up and use it as a blanket or use it to cover your legs. It is comfort + style. Wear a light Jacket or Coat or Cozy Cardigans, they add layering when you get cold, you can take them off when it’s too warm. It can mix and match with almost every color you have and it’s also easy to take off when you’re going through a security check in the airport and you can put it back on and your outfit is put together. Having that little extra layer adds a few extra details to your look. Gray, black or stripes. These colors don’t show dirt and go with everything. When the climate allows, a casual dress and jacket is a good combination. In terms of length, it all depends on what you’re comfortable with. Printed scarves are something that matches with everything. So, thinking about layers get creative on the mix of textures, colors, and items. Invest in a strong and tidy tote bag that keeps all your necessities but doesn’t feel like a heavy duty carry on a bag. It keeps your goodies and all your must-haves together but in a stylish way. Another option is to carry a cabin bag with four wheels. Combine this with a mini crossbody bag with your passport and ticket stashed conveniently inside, stylish comfy shoes, a pair of killer sunglasses, and you’re ready to breeze through the airport like a celebrity. Comfort beats fashion when it comes to travel shoes and you need to make sure they won’t hurt you. Talking about the airport walking not everyone feels comfortable with high heels especially boots or peep toe shoes. However, when it comes to travel shoes, choose comfort, no matter your favorite style of shoes to travel with. The ideal shoes are neutral colors that will go with everything no matter the style. Choose a few pairs that serve multiple purposes like slip-on loafers or sneakers that are easy and light rather than trying to bring a pair for every occasion. They include tan, black, ivory, brown, maroon, navy and for adventurous, leopard print. Look for something that has a little zipper like ankle boots with a little wedge/heels that can elevate your outfit. With that, it’s easy to just zip down, walk through and you’re good to go. You can definitely wear a shoe that is fashionable and stylish as long as it’s easy to access, then it’s perfect for traveling. 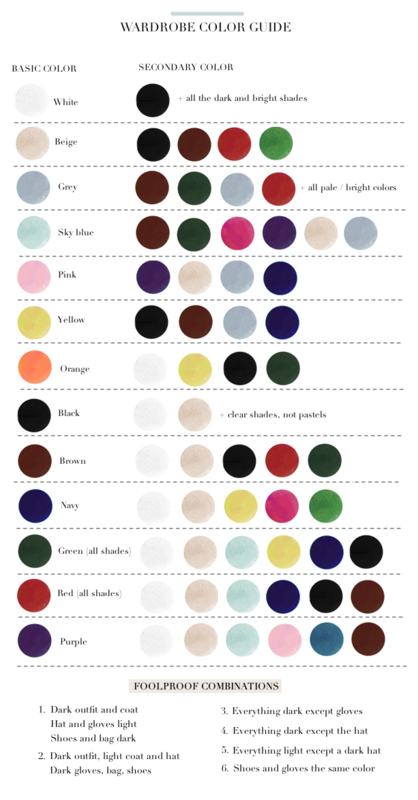 Use this simple color guide to know what colors you can match. Pick one item to focus your look on; either a shirt, a pant or a kimono, even a bag. Use this”focus item” to develop the rest of the look matching the right colors. Make sure you can match several items on colors and styles.